“Geostorm” begins and ends with references to the meteorological state of things, suggesting, at least in a broad sense, our impending peril if we refuse to take climate precautions. This is heart-warming and a little surprising because “Geostorm” was written and directed by Dean Devlin, old running mate of Roland Emmerich, who himself made an ecological disaster movie almost fifteen years ago, signaling how these men who once teamed up to cinematically destroy the earth now have an interest in trying to save it. But fear not, Movies Are Escapism absolutists, because between these bookends “Geostorm” exists purely as an aspirant action movie spectacle with nary an environmental lecture. Alas, even in that context “Geostorm”, if you will permit a weather metaphor, is like a snowmageddon that fizzles out, leaving us with less excitement than a few disappointing flakes, and without any good weathermen front and center to describe the action. The Geostorm, it turns out, is not a natural event but a potentially catastrophic manmade one, brought about by a global network of satellites created to control Earth’s weather that is sabotaged. This system, designed by quasi-grizzled Jake Lawson, and now overseen by Jake’s less quasi-grizzled brother Max (Jim Sturgess), is deemed Dutch Boy as a reference to the fable in which the little dutch boy put his finger in the dam to prevent its bursting until the town’s adults could arrive to fix the leak. This could well evoke shades of Right Now, what with various Florida children calling certain adults on the carpet, suggesting that these kids can only hold their finger in the dam for so long and so, for God’s sake, Responsible Grown-Ups, do something. But “Geostorm” was, of course, made well in advance of Right Now, and anyway, as previously stated, this is all about Escapism, not Relevancy, so my apologies for even bringing it up (again). And that, perhaps, is why the Big Twist involving the sabotage of Dutch Boy connects not to, say, some eco-terror group determined to let Earth decide its own fate without manmade intervention, but a government operative gone rogue. That’s an ancient reveal given more mustiness by the character responsible, a person whose identity you will see coming from a long way off given the Law of Names on the Movie Poster. That doesn’t have to be a bad thing, just as the idea of the government being in on the Geostorm doesn’t have to feel rote. Indeed, the movie’s best line connects directly to this development, when the secret service agent in a relationship with Jake’s brother, Sarah Wilson (Abbie Cornish), whose lifeless name correlates directly to her lifeless character, is pressed for help in putting a stop to this diabolical ruse and quizzically remarks: “You’re soliciting a Secret Service agent to break into the White House server and illegally obtain files?” There’s your movie! That’s a movie conjuring up thoughts of Nicolas Cage stealing the Declaration of Independence to save it! Yet Dean Devlin, who so long ago demonstrated aptitude for whimsically rendering the hokey, proffers no such imagination here, never embellishing his absurd plot with any cornball flair, and never giving his action sequences any insouciant je ne sais quoi, emblemized in a car dodging Geostorm-induced lightning bolts like some foggy arcade game. 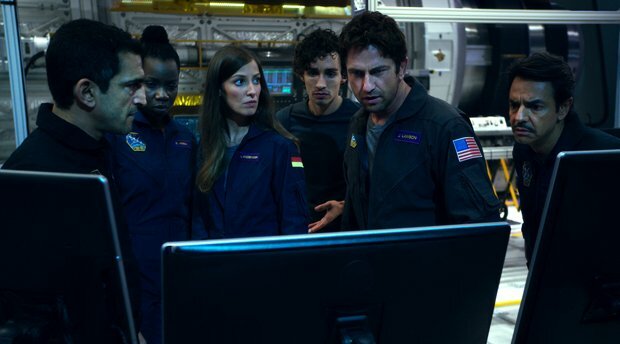 In that line, for a second, “Geostorm” lives its most joyfully ludicrous life, making you wish they’d torn the whole production down and built it back up infused with the scent of that line reading’s agreeably stinky cheese.